The lessons in French-Canadian culture come from a fascinating mixture of English, Scottish, Irish, and French tradition shaped by the dominant religion, Catholicism. Many folktales feature the village priest and his enemy, the Devil. A favorite cautionary tale about the Loup-Garou, or Werewolf, includes important information about the reason for the beast’s condition: neglecting to go to confession for seven years. Stories were sometimes told in song. The kind of singing that was often done around the kitchen stove became known as “kitchen music.” Work songs, meanwhile, told stories to ease the task and pass the time, while providing a strong rhythm to drive the action, whether paddling or marching. Songs of the voyageurs told long, involved stories, giving us some idea of the enormous distances that the canoeists traveled, singing all the while. The story of the Chasse-Galerie emerged in France, when tales of a historical family merged with the widespread European idea of the “Wild Hunt.” In the French story, Lord Gallery is condemned to lead a spectral hunt through the skies for eternity; his sin was hunting instead of attending Mass. The story is still told this way in both France and Louisiana. 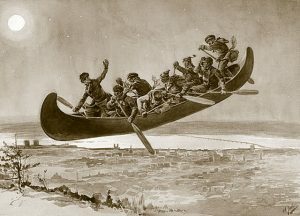 In the Québécois version, a group of voyageurs makes a pact with the Devil to secure the use of a flying canoe to return home in time for the celebration of the New Year. The Devil sets some rules: no swearing, no liquor, and no staying out past curfew. Of course, the voyageurs cannot meet these terms. In some versions, they are dumped out of the canoe and wake up with sore heads back in the wilderness. In others, they are condemned, like Lord Gallery, to fly through the skies forever. One of the quintessential characters in French-Canadian stories is “Ti-Jean,” short for “Petit Jean,” or Little John. Like Jack in the English and American “Jack Tales,” Ti-Jean is the wily youngest brother who wins by using his wits. Ti-Jean originated in France, and there are stories about him wherever French people have settled, from Québec to Louisiana and from Acadia to Haiti. In various French-Canadian stories, Ti-Jean defeats giants, dragons, and the Devil himself, usually marrying a princess in the end.